A key component in becoming an elite influencer is developing your ability to listen, and crucially, listen well. Listening is an essential skill, but to be able to listen you must have first encouraged the other person in your interaction to talk. The most common way to initiate a level of dialogue is to ask some form of question. I often hear people talking about the requirement to be a good listener but I never really hear people critique how good they are at asking questions. 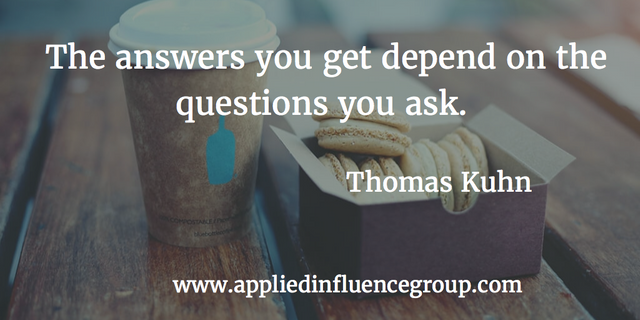 So, how good are you at asking questions? This may be more of an issue for the Brits among us as we have a tendency to be… flowery or opaque with our language. But regardless of your nationality I often see a tendency for those of us asking the difficult, awkward, usually essential questions, to add quantifying statements afterwards in some form of attempt to soften the perceived blow the question may have inflicted upon its recipient. I’m not sure why some of us default to this, what is the issue with just leaving the question out there to be answered. Maybe it’s a way of taking the edge off what may appear on the surface a socially uncomfortable situation, or maybe we feel a degree of vulnerability when we know that directness is required. However, the impact of doing this is significant, especially if we need / require information from the person we are communicating with. In providing the additional context or, even more damaging, providing a couple of answers to your question for the recipient to choose from, you close off communication channels. On the occasions where gathering the additional detail is essential you need to just trust the question in its raw state and trust that it will get answered. I can think of several occasions where I have been involved in conversations whereby it's very clear the conversation leader is uncomfortable with the questions they have to ask and have defaulted to the format above. Although the questions posed were open in nature and would have allowed me to articulate my point of view, the additional information or answers provided to me in the delivery of the question didn’t lessen the impact of the question or make the environment more palatable. Instead they gave me an easy way out of the conversation, and an easy way to get away from that interaction without really providing any degree of information. Planning the delivery of your questions in an interaction effectively, and crucially trusting the validity of those questions, will give you the confidence to trust them when you come to delivering them. From an influence perspective, the delivery of effective questions will provide you with the time in an interaction to really listen and evaluate what is being said to you. This time will also lead to an enhanced level of understanding of the individual involved in the interaction. Planning to use questions that encourage the recipient to talk will, ultimately allow you to elicit far greater levels of information. The article below provides an additional perspective on the requirement to be slightly more direct in some of the things we do. I wish more people communicated clearly.